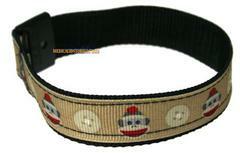 Cute little sock monkey Laser engraved medical id alert sports band bracelet for kids and adults too. The sock monkey design medical id alert band is perfect for any girl or boy Medical Alert Sports Band Bracelet is Adjustable from 5 - 7.5 inches The medical Id alert tag can be easily removed and put on another medical Id band! Our medical id alert sports band come complete with a 316L hypoallergenic stainless steel medical alert plate in your choice of emblem colors.